Case: Mulder and Scully investigate the bombing of an art gallery. Destination: Southwest Texas and Washington, D.C.
And, there you have it, my friends. The entire run of The X-Files summed up in five lines of dialogue. This could have been it -- the episode in which Chris Carter finally, finally, reveals to us what his game plan has been all along. Instead, like so many of his episodes, this one was a mess. Carter likes to explore Big Ideas and he likes to put his characters in some seriously weird environments, all of which is fine. The problem, of course, is that by trying to do too much in one hour, it all becomes a bit half-baked. The opening sequence was engrossing. From watching Shiraz pray, we have to watch as he is jeered by locals in a pickup. While I was uncomfortable at the overt racism, I must admit that there was part of me waiting for something to blow up. I’m not proud of the fact that I was right, nor am I proud of Chris Carter for taking the easy road and using the Muslim faith as shorthand. For a show about monsters, I did not like the monsters chosen this week. Shiraz (an unfortunate name for those of us who drink red wine) is meant to be a sympathetic character, but it is difficult to feel sympathy for a man who causes people to run from a building on fire (a terrible image that stayed with me) whether he detonated his vest or not. Again, we did not know enough about him or his motivations. Carter tried to find the balance. The Homeland Security guys were speaking Arabic and looked as though they were up to no good. There was that weird moment when the nurse turns off the machines. Carter didn’t follow through; these scenes just sit there. The perfect example of too much imagery is the one in the boat. We have a Muslim who is crossing from life into death. He is on a boat, clearly an allusion to the Greek and Roman myths of entering the afterworld. As if all that weren’t enough, our Muslim is lying in his mother’s arms in an exact replica of the Christian pieta. What exactly Carter is trying to do here is lost in a game of name that religion. Miller and Einstein were more successful characters. While the doppelgänger aspects were so overt as to be eye rolling, there were some fun moments as the four interacted with each other. Again, however, we were only given half the story. Did Einstein give Mulder mushrooms and is now just covering her back or not? The idea that Mulder willed himself into such a state, and successfully foiled more explosions, is one that is worth exploring in much more depth than was done here. I’ve said it many, many times before. What saved this episode from going completely off the rails was Mulder and Scully and their relationship. I love how they have come together again over the course of the past weeks. The way they talk to each other and look after each other is heartwarming. I found the final scene wonderful. While the conversation was a bit on the nose, I liked the way they were together. All kinds of crazy may go on in their lives, but in the end, it is them, walking down the road, hand in hand. Sigh. -- Robbie Amell and Lauren Ambrose are to be congratulated. They both managed to play their roles (and the obvious subtexts) without winking at the audience or going too far down the rabbit hole. Not an easy line to walk, I would think. 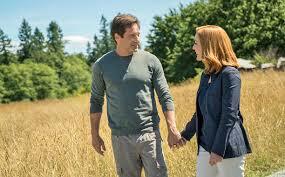 -- It occurred to me as I was writing this that Carter may be setting up Miller and Einstein to be the next generation, the continuation of this series without Mulder and Scully. I pray to all the gods referenced in that boat that I am wrong. -- We got another shot of the quarter from the previous episode. Why? -- I’m not sure what we are meant to take away from that ending. What did those trumpets have to do with anything? While I love music (and I have most of these songs on my iPod) this much music felt odd for an episode of this show. -- Finally, I would like to thank my partner in crime, Heather. As I wrote this review, she gave me her usual unfaltering support and encouragement. She is as much a part of this post as I am. Final Analysis: Messy and crazy, but with one of the great scenes of all time. I’ll be very interested to see how this one goes down as canon. The best thing a reviewer can do in an episode like 'Babylon' is lovingly help people process it. You did this in spades. I'm not surprised but I am impressed. I agree with your characterizations of this episode and what ultimately makes it worthwhile and watchable. Chris Carter has a way of making the audience feel unsafe. When the narratives do come together, we breathe a collective sigh of relief. It didn't here but DD and GA are such pros, it didn't even matter. Amazing review, Chris. You took a bullet with this one and you did it with a clear head and loads of elegance. It absolutely had problems and I'm tired of Muslims = Terrorists, but Mulder line dancing while he thought he was stoned on mushrooms was absolutely totally great. I also enjoyed Lauren Ambrose and Robbie Amell as Scully II and Mulder II. What's been bothering me about these new episodes is I'm not seeing much character motivation. Why did Skinner want M & S back? Why is Scully acting like she suddenly doesn't have a life? She hasn't mentioned her hospital job. Does she miss Mulder? Is she having her own midlife crisis? I can understand Mulder wanting to chase monsters again, he didn't seem to have anything else better to do. It just seems like they are milling around that basement office waiting for??? Besides M & S reconnecting, this one was too weird. Hopefully the next episode will be more focused. The preview looks exciting. Chris, we are so in sync. Everything I thought about this episode is exactly what's in your review! Excellent review of a very difficult episode, Chris! I love the amount of Vancouver actors on this show. And I love that I can tell where shows filmed by how many BSG (and Continuum and Arrowverse) alums) pop up. Watching Mulder getting stoned, placebo or not, was almost as much fun to watch as when the Vampires in True Blood got stoned on Lilith's blood, and went to Mardi Gras. Will Einstein (couldn't they have come up with a better family name?) and Miller take over X-files from Mulder and Skully? Why? Because Einstein is clearly in love with Miller, and Miller really wants the job.